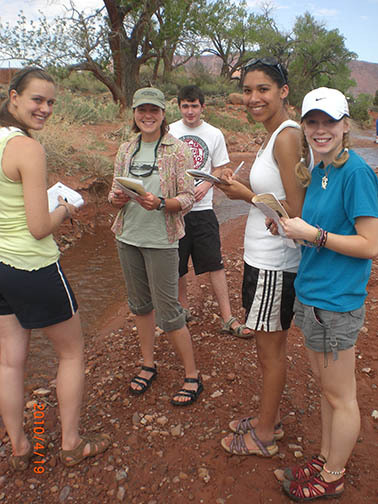 Designed for middle and high schools groups, our Canyon's Edge Field Camp Program immerses students in the physical and cultural geography of the Colorado Plateau with an emphasis on soils, geology, water, plants, animals and human relationships to this arid land. 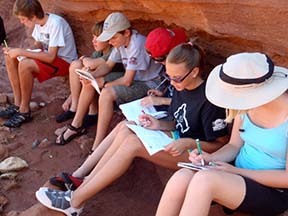 Students receive instruction accompanied by a specially designed, printed workbook journal and enjoy physical challenge and exciting, fun-filled exploration and adventure. A special thank you goes to these major foundations for curriculum development, teaching materials and ongoing scholarship support for CFI's Outdoor Science School programs: Ruth H. Brown Foundation, The Chasman-Wiancko Family Fund, The William H. and Mattie Wattis Harris Foundation, the Rocky Mountain Power Foundation, and The Palladium Foundation.